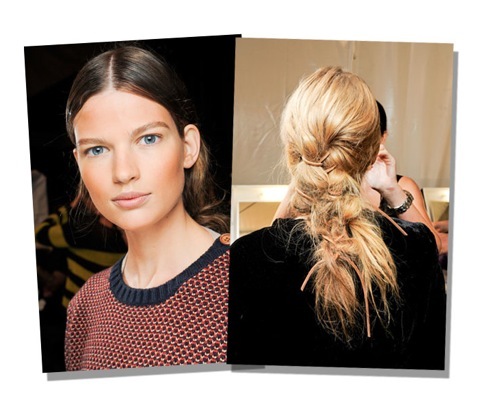 The undone braided hair is still going strong as seen at Proenza Schouler and Michael Kors Spring 2012. I especially love the disheveled braids at Proenza with resembles an hybrid of braids and mohawk. It has some rockstar feel element. The Michael Kors version is more bohemian with the leather string braided through and centre parted hairline. Getting the texture and height will surely require lots of teasing and spray...maybe even preferably a 2 day old hair. I've personally tried the fishtail and regular side braids many times but they usually get a little too undone by the end of the day. We have a dinner party tonight, maybe I can try doing the undone again? How much does love costs? OUTFIT DU JOUR - Huston, we have a problem!